When Lauren Moore was six years old, her mother, Anne Marie, suggested that she try a class at the U.S. TaeKwonDo College. "I liked it," Lauren reports. "We were totally sedentary," says her father, Michael, who spends his working days on a computer. He decided to enroll as well and also recruited his mother Bonnie, a Eugene native and a pharmacist. She calls it "a great family activity." Taekwondo is a traditional Korean martial art that was formalized for competition in the 1960s and 70s, and the only martial art to be contested in next month's Rio Olympics. 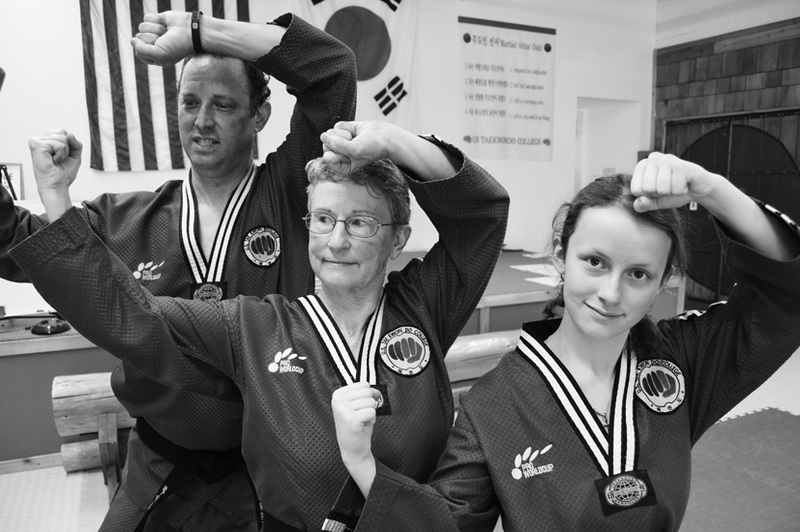 The Moore's mentor is Great Grand Master Lee, a former hand-to-hand combat instructor in the Korean Army, a former judge and trainer at U.S. Olympic Trials, and a 9th degree black belt, who founded the college in 1987. His teaching philosophy stresses positive thinking, positive talking, positive acting, and perseverance. In March of 2016, nine years after they began, all three of the Moores succeeded in testing for their third degree black belts. They were tested on advanced sparring and kicking techniques, and required to break multiple boards. At ages 73, 47, and 15, they are the first three-generation third-degree black belt family recognized by the World TaeKwonDo Federation. Bonnie is now retired from pharmacy and Michael has taken up running. Lauren is a tenth grader at Elmira High School and a community theater performer with Actors Cabaret of Eugene, currently appearing in The Little Mermaid through July 23.